Sambucol Extra Defence is a health supplement that helps to support the immune system. With an AntiVirin® action, it's rich in extra-strength vitamin C, zinc, antioxidants and minerals, which can help to boost your body's natural defences. Featuring a delicious black elderberry flavour, the non-drowsy supplement is free from alcohol, gluten and artificial colours and flavours. Suitable for ages 12+. - L.M. Recommended Daily Dose: Adults and children aged 12+: 10-15ml. 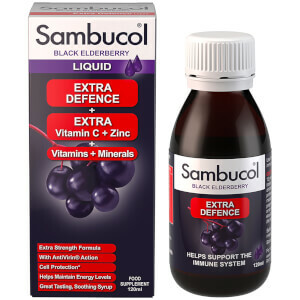 Winter Dose: Adults and children aged 12+: 10-15ml four times daily. Glucose Syrup, Black Elderberry Juice (Antivirin®), Purified Water, Vitamin C (Ascorbic Acid), Natural Flavour: Raspberry, Acidity Regulator: Citric Acid, Preservative: Potassium Sorbate, Zinc Gluconate, Pyridoxine Hydrochloride (Vitamin B6), Copper Sulphate, Betacarotene, Folic Acid, Sodium Selenate, Cholecalciferol (Vitamin D). Suitable for vegetarians.